New 11,205 sqft store has been designed using feedback from customers to offer the very best feel good experiences. 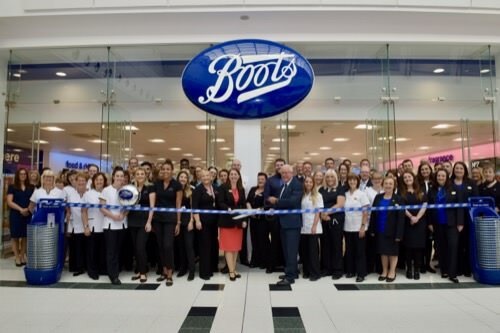 The Stirling Boots UK team are celebrating the opening of their brand new, relocated store in the Thistles Shopping Centre, with an official ribbon cutting ceremony alongside Bruce Crawford, the local MSP, and Elizabeth Fagan, Senior Vice President and Managing Director of Boots. The 11 and a half week relocation project has created a beautiful new Boots of the future, offering customers new and exclusive beauty brands, convenient healthcare solutions, and a range of pharmacy services. With its modern beauty space, customers can discover new brands, including Liz Earle, GLAMGLOW, NYX, Benefit, Smashbox, CYO and Obsession, some of which will be available for the first time in the city. Beauty specialists will also be on hand to share their expertise and advice across all beauty brands, and customers will be able to access the entire Boots beauty ranges, including luxury brands, in the heart of the high street, using an integrated next day Order and Collect Service*. Customers and patients can also make the most of the store’s new dedicated pharmacy and healthcare area that brings together Pharmacy, Boots Opticians and Boots Hearingcare into a simple, convenient and seamless healthcare experience. The new store will also offer confidential consultation rooms where patients can access a range of pharmacy, Opticians and Hearingcare services, including flu and travel vaccinations, as well as eye and hearing tests. Multi-skilled advisors will also be able to offer complete healthcare solutions to the local community. Boots has been at the heart of Stirling’s community for 85 years, with the Thistles welcoming its first Boots store on 17 June 1977. At its launch, the store devoted a section to Scottish souvenirs, as large numbers of holidaymakers would pass through the city every year. 40 years later and Boots is still helping the community, and visitors to the city, to feel good. *Place an order online or in store before 8pm, for free collection in store after 12pm the next day, exclusions apply. The service is available Monday-Saturday in over 2,300 stores, excluding the Scottish Highlands/Islands, Jersey/Guernsey and Northern Ireland Stores. See the store locator on boots.com for your local store opening hours. See boots.com for details.